As anyone who has been reading my blog over the years has probably realised, it would appear as I have not written anything for some time... that I had apparently gone on some kind of hiatus. 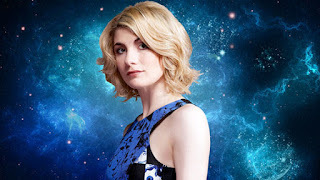 It would therefore be a little ridiculous for me to begin this post by saying something like "I have been strangely silent on the topic of recent developments in the world of Doctor Who", when silence has pretty much been my modus operandi. Nevertheless, my silence has largely extended beyond the realms of blogging... I've not said much on Twitter or Facebook. Instead, I've sat on my mountain watching the shenanigans. I think now is as good a time as any for me to re-enter the fray on both the micro and macro level. I suppose I should start by giving you some context. I have been something of a traditionalist in terms of casting the Doctor. In the past I have maintained that the Doctor should be male, largely for two reasons - firstly because of in-universe consistency and secondly in terms of supporting a feminist counterargument about the fact that in terms of progressive non-violent fictional male role models, the Doctor is pretty much alone... and that taking that away is arguably killing the golden goose (this argument is similar to the one put forward by Peter Davison). I also do not find it a healthy way of breaking the "glass ceiling". To truly do that, a female character has to be positive and strong in their own right... without borrowing a male legacy. I would say that in the case of the first argument, that it seems highly odd that a member of a species for which we now are to accept treats gender as physically flexible between incarnations, would take over a millennium to decide that he'd have a go on the other side of the fence. Incidentally and purely for the record, I never treated the issue of race in that argument. So does this mean that I would never be accepting of a female Doctor on this front alone? There are several ways on that sole argument that I would be happy to find a workaround. In my own head, before Peter Capaldi inherited the role, I would have been content for the Doctor to have an entire set of female regenerations in the new cycle gifted to him (although I think the way he *received* those regenerations was written terribly). I would have also have been content for him to die permanently and bequeath his title to say - Jenny, Susan or Romana... after a reunion with any of them. Aside from this, there's also the notion that actually, the only reason the Doctor has never been a woman over the show's run until now, may have more to do with British societal attitudes restricting producers choice. It would seem the original producer never felt that the role would always be male... and fourth Doctor - Tom Baker, also provocatively put the idea of a female Doctor forward when discussing his departure. It was my second argument, which whilst slightly more simplistic... provided more of a block. Whilst I still maintain there is a valid point to be made in the argument... it is a wider problem that transcends Doctor Who and I think all progressively minded individuals could find common ground if we accepted that actually there's a need to deal with such things on the macrocosmic rather than microcosmic plain. Both arguments are actually correct. Girls need more positive role models and boys need more progressive ones. If we wrote more characters that covered both these bases, this would be a non issue... nobody would need to demand any character be one thing in terms of representation... because representation itself would no longer be an issue. For me it's not so much that there is a glass ceiling and more that both male and female characteristics have grown too big for the floor of the building they now occupy and the divider needs to be removed for both their benefit - the ceiling may be too low downstairs, but the floor is also too high upstairs. However... all that musing is now by the by.. We find ourselves in a different world. We all must face things as we find them... and not as we wish them to be. No doubt some, having read my contextual arguments... will assume that when the announcement of Jodie Whittaker's appointment came through, that I went all Chicken Licken and lost my mind in a red mist of vitriol. And yet, they'd be wrong. Admittedly it did help that I wasn't watching the dedicated TV show (I was playing D and D at the time and caught the announcement via BBC News apps headline announcement), so I was removed from all the high emotion. However, I have to say that when the announcement came through I had a genuine peace about things. I think I'd compare my emotional journey as having been akin to an aircraft breaking the sound barrier. As a vehicle approaches supersonic speeds, compressibility and drag generate flight instability, but once the craft has passed beyond supersonic, flight becomes smooth again. There's a minor character in Babylon 5 who goes on a similar journey. Early in the third season, he is sounded out about the possibility of rebelling against Earth... and he seems against it (much to the disappointment of the command staff); however when everything hits the fan in the middle of the season and a fleet of Earth ships rocks up, he's given the choice to walk away... but stays loyal. You can't always tell what way a person will jump based purely on their prior convictions. It's also equally dangerous to make assumptions about a person's motives or about where they stand on a topic, purely on the basis of their arguments. One of my recurring fears at the moment is the polarisation of modern society. Suddenly it seems, everything has become about "us versus them". There is no middle ground. At first I noticed this with the ultraconservatives and ultraliberals.... but it is a malignancy that has spread much further - Brexit, generation conflict, gender, nationalism... the fallout over all these is rooted in the same disease. It damages friendships and destroys dialogue. It takes no prisoners and causes collateral damage in the middle ground that gets denied. This is a much larger topic which I hope to return to at a later date. People saying the show is dead and refusing point blank to watch it any more. People pre-empting negative responses and making vitriolic statements that those who held different views were never fans of the show. People "Virgin shaming" others who were against the idea. That last one is something that particularly annoys me. I find it ridiculous and unacceptable. We live in a society that quite rightly frowns on and calls out against those who abuse/persecute select sexual minorities and yet turns a blind eye when people use another as a badge of shame. There is no shame... celibacy is a perfectly valid choice. And for those who don't necessarily make that choice, but find themselves living under the banner... I think getting hung up on that one aspect of life leaves you a bit lopsided and sets you up for more trouble. But really all these reactions are over the top. We absolutely need to respect that in many cases, people are needing to make a journey along the change curve. Though I personally accept the change in direction, I do still harbour a few reservations... and having sympathy with some of those who now find themselves ostracised for the position they maintain, because I once trod their path... I find personal attacks and aggression towards them, unacceptable. Capaldi's Doctor openly defies regeneration. In conclusion though, having thought long and hard about the way The Doctor Falls ended, I'm actually starting to think that the show itself is going to do something very meta to the audience. The Doctor's stubborn and this time physical refusal to regenerate, mirrors the emotions and thoughts of many people who are not sold on the idea of Jodie Whittaker taking over. The fact he runs into the First Doctor who seems to be at the point in his journey when he has to make the same decision only amplifies this. Could it be that this year's Christmas special will serve as group therapy for those who feel this way and are stuck on the change curve in the 5 stages of grief? All that remains to be said really is "good luck, Jodie". What are your hopes and fears going forward?